MiniFolio is a very clean and simple free WordPress theme that will allow you to easily set up an online portfolio and a very simple blog. 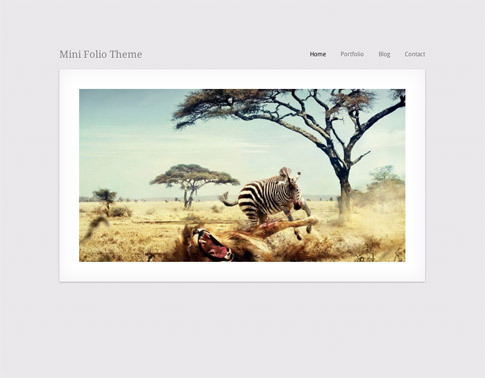 MiniFolio theme uses custom post types for the portfolio so you can add items easily and on the portfolio page people can either open the image with PrettyPhoto or visit the detailed portfolio page. You can have an unlimited amount of portfolio items and visitors can easily browse through these categories and from one portfolio item to the next. The blog is very simple to use. WP Explorer did not include any sidebars, so the focus remains on your content; however, you can have author bios, related posts, and threaded comments. The main focus is the homepage with the slider and the portfolio page, so it has kept the blog very simple. 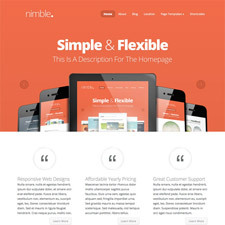 Come back and check out the showcase as we find more sites from around the web using MiniFolio.